Don't you just love vacation time? I'm lucky that I get more vacation time than most people, so I really can't complain, but there is a part of me that wishes life was one perpetual vacation. I'm pretty sure if I won the lottery I would make that dream a reality. Some people might feel that life would get boring if they didn't have a job to go to everyday and a purpose, but I assure you I would find a way to fill the days. For example, with my newfound wealth, I would purchase a vineyard and start my own private wine label. Afternoons would be spent surveying my property, admiring the vines and the vistas from atop my vineyard estate with a glass of Cabernet in hand. Well, it's fun to dream. In the picture above, I sort of put myself into that mindset. 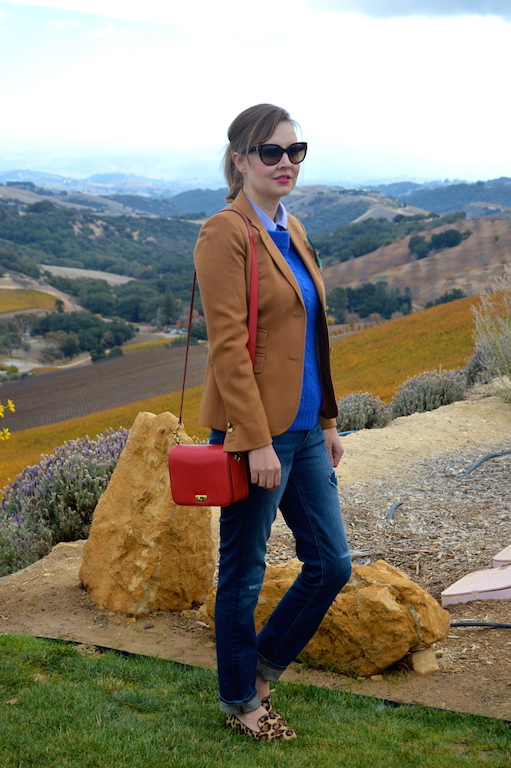 I'm actually at Daou Vineyards, which is one of my new favorite places to visit in Paso Robles, California. It combines everything I love: gorgeous scenery, a beautiful Spanish Colonial-style tasting room, and, of course, great wine. It was founded by the Daou brothers who made it big in the tech industry and then decided to try their hand at the winemaking business. Sounds good to me! If only I had the entrepreneurial spirit or some knowledge of technology, then I could follow in their footsteps! Alas, I sadly lack both. If you can't be a billionaire, I guess that next best thing is dressing like one. 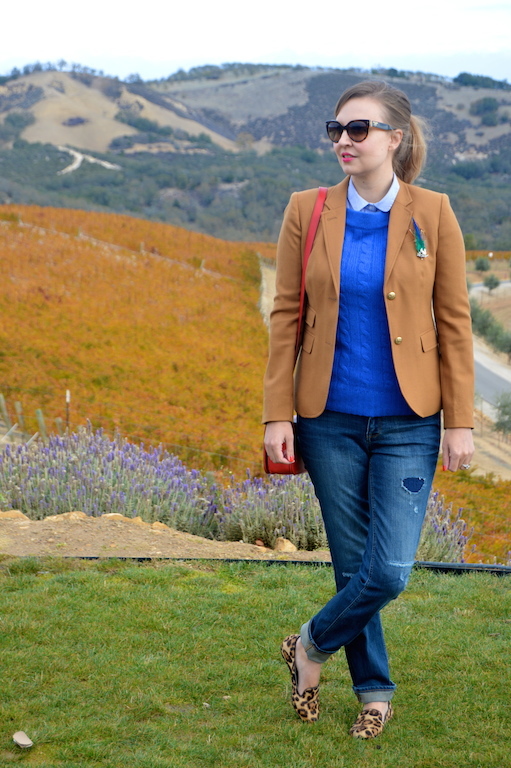 The day we visited Daou was cold and blustery, which is my favorite kind of weather. 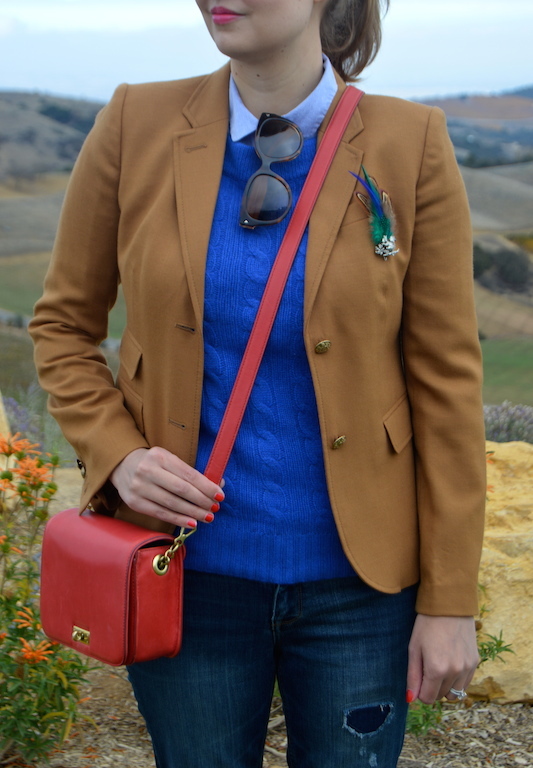 I donned a camel blazer adorned with a pin my husband bought me from Orvis one year for Christmas (it's a squirrel) and a cobalt blue sweater underneath. My jeans have some obvious holes in them, which may not scream billionaire, but as my father in law jokes, "they charge extra for the holes." While my outfit is on the conservative side, it's always my goal to add a little element of surprise or quirkiness to any outfit I put together. For this outfit, that took the form of some leopard smoking slippers. In the winter, I live in these leopard loafers, as they somehow seem to go with everything. My husband will argue that leopard is not a neutral, but these slippers point to the contrary, in my opinion. 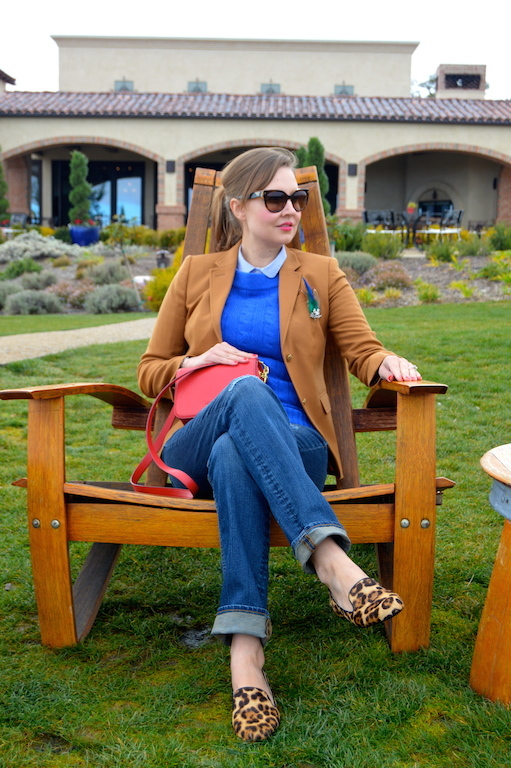 Since loafers are sort of my go-to footwear for the fall/winter months, I've picked out a selection of some other loafers that I would just love to loaf around in, preferably on my vineyard estate, but really these are all perfect for just about anywhere. Thank you Mica! Primary colors like red and blue can really pop with the help of a little leopard! Thank you Lindsey! Yes, the pin was a really unique and lovely gift from my husband. He has good taste! The vineyard is one of the most beautiful in the area in my opinion. Thank you so much Kim! I'm very excited that I convinced at least one person that leopard is a neutral. I'm going to pass that info on to my husband who still denies this! Yes, I did have a little wine this weekend from our trip, although our property doesn't quite resemble the beauty of this vineyard, but one can dream! 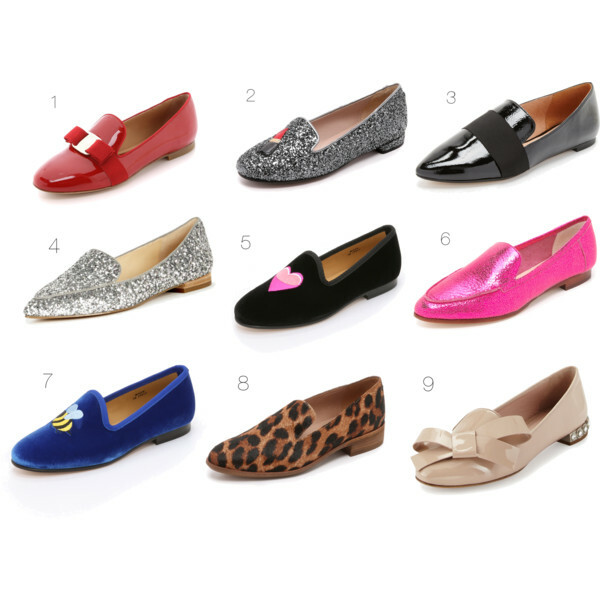 I love the preppy look - leopard loafers are so adorable! Thank you! I wear these leopard loafers all the time. They truly go with everything. Love your outfit so much, that blue is amazing! Lol, I have a very detailed plan if I won the lottery too. Not a wine label, will be a fashion label. ;) Let's all get lucky! Thank you! I wouldn't mind a fashion label either. It's always fun to dream big. Thanks for the invitation to your link up! I love this look and I tend to layer pretty much the same way! I think leopard and blue is one of my favorite combos and I just grabbed a pair of leopard loafers like that from J.Crew Factory recently. Feel free to stop by my blog and join my link-up! Have a lovely week! Beautiful photos! 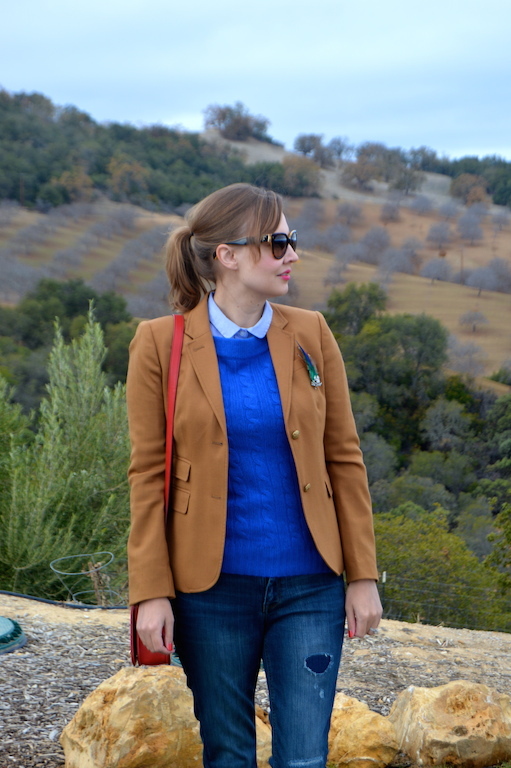 I love this preppy layered look! Those loafers are fab! 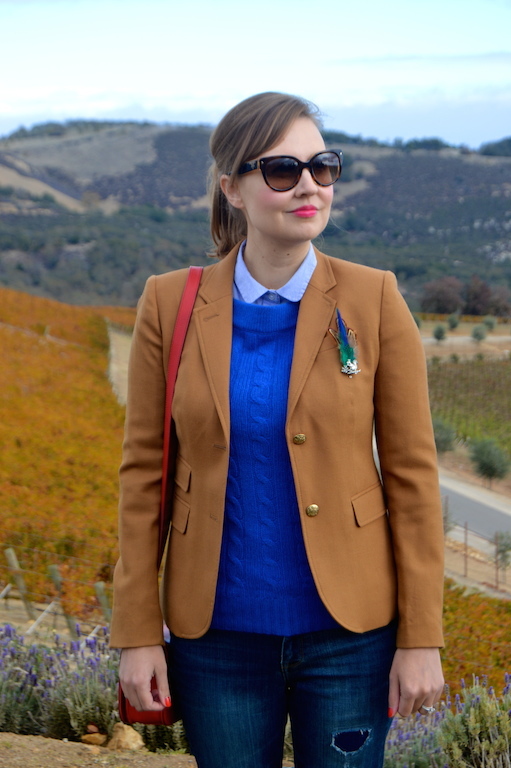 Always put together, love the blazer and shoes, and your pics on IG of the winery, my fav thing to do!